Today I'm here with the awesome Kendare Blake. I really enjoyed her haunted (see what I did there) novel, Anna Dressed in Blood, even though, as you know, ghosts are not really my jam but Kenare's writing still pulled me in and I actually liked it a lot. You can, if you want, totally check out the interview I did with her last year about it right here. YA as a category to me just means that the main protagonist is a teenager. There are so many different genres and themes under the YA umbrella that protagonist age is the only common thread. But, YA also means a very cool community, a subculture of books and bookish folk that didn't exist twenty years ago. It's pretty rad. HELLOOOO, BLOGGING COMMUNITY! How I love to stalk you, and follow along with fun features, and interesting conversation posts. I visit a lot of blogs (a lot!) but some that I have visited regularly include My Friends are Fiction, Cuddlebuggery, Reading Teen, Dark Faerie Tales, The Page Turners, The Book Rat, Me Myshelf & I, and lots of new ones I discover every week it seems like. Sure. Something about me....let's see, right now I'm having serious Penny Dreadful withdrawal. I love the Neverending Story movie but I haven't seen it in years. I don't love the Adam Sandler movie Just Go With It, yet I seem to watch it whenever it is on. 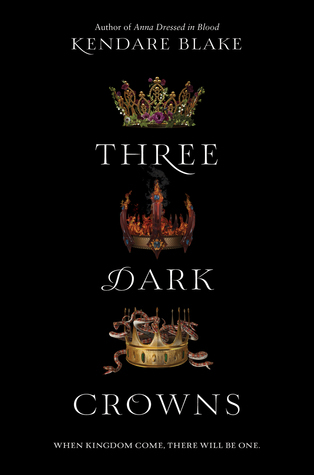 About THREE DARK CROWNS: Triplet sisters, all queens, facing what seems to be a no-win situation. 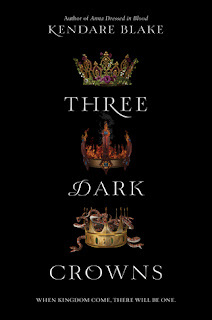 Become the Queen Crowned, but to do so, two others must die. It was a lot of fun, writing this and seeing how each sister navigated her particular set of circumstances. I love to write about girls at odds, and girls in charge. And now I have that old metal song stuck in my head. "Girls, girls, girls!" Unfortunately that's the only part of that song that I know. Thank you so, so much to Kendare for coming and answering my questions. What do you guys think of them? Also, have you read her book? If not you totally should give it a chance! The next post will be up July 13th and feature the next awesome author.